Pipeline planning, sizing and performance criteria. Pipeline design and analysis tools. Preliminary design and opinion of probable cost. Final design, specifications & cost estimate. Act as Owner’s Representative during fabrication and deployment. 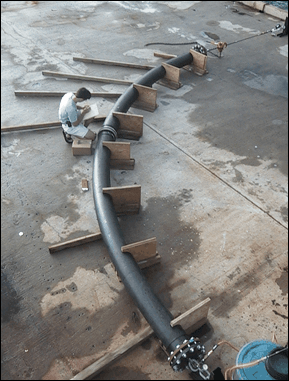 Makai has been pushing the state-of-the-art for marine HDPE pipelines for nearly 40 years. 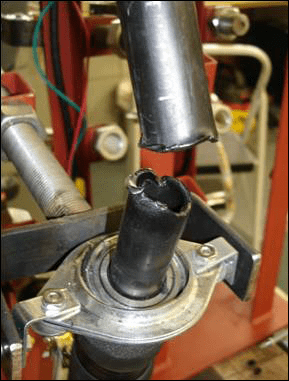 In our quest to design cost-effective designs and deployment methods, Makai found that the materials information provided by HDPE pipe manufacturers was insufficient for our needs. 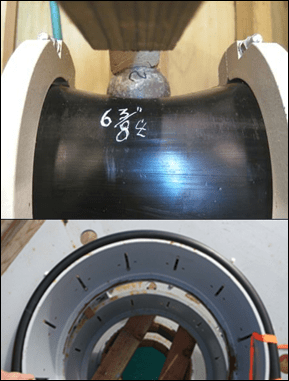 We found it necessary to collect materials testing data on HDPE to a higher level of sophistication than was previously available from other sources. 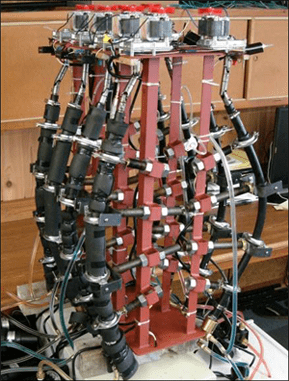 Makai has performed a number of mechanical and materials tests including fatigue testing, long-term modulus of elasticity (creep) tests, crush tests, and suction/ovality tests. The result is an extremely comprehensive materials database for HDPE resins that allows Makai to push HDPE to its practical limits, resulting in cost-effective and lasting designs. Pipeline performance requirements and design criteria are defined in terms of the client’s water needs. These criteria will include water temperature, water purity, flow, reliability, lifetime, location and budget restrictions. In most cases, all of these parameters are not fully defined at the start of the design process; pipeline flow, operating budgets, and even location are commonly dependent upon onshore facilities that are still in the planning, design and permitting phase. A study is performed to quantify the choice of best pipeline length, diameter, wall thickness and operational lifetime for a given project’s flow rate, capital budget and operating budget. The results of the study often present the client with tradeoff decisions such as saving money on capital versus lowering operating costs. MOE assists the owner in finding the pipe dimensions that best meet his objectives. Other tradeoff studies are performed as necessary for each individual project to best economically and technically fit the pipeline into the client’s overall operation. Even the location may be uncertain during the planning phase; since the pipeline costs are significantly affected by the location, Makai identifies and provides critical information relative to pipe site selection. Based on previous pipeline costs, Makai can price various pipeline and pumping options such that the client can be well-informed for these critical decisions. 3D Design software: Solidworks, AutoCad. Finite Element Analysis (FEA) software: Orcaflex, ANSYS, MakaiPlan Pro, MakaiLay, Makai Pipe Deployment Software. Computational Fluid Dynamics (CFD) and related software: Environmental Fluid Dynamics Code (EFDC), CORMIX, Fluent, Simulating WAves Nearshore (SWAN), WAVEWATCH III, Cosmos. Systems Engineering and Economic Modeling Software: Makai OTEC Thermodynamic and Economic Model (MOTEM), Makai Seawater Air Conditioning Model. Geospatial Information Systems (GIS) software: MakaiPlan cable route planning software, GeoMedia, ArcGIS, Global Mapper. Data Collection and Analysis software: LabView software, OTEC Power Plant Data Collection & Control software, Makai Real-Time Corrosion Measurement System (RCMS) software. 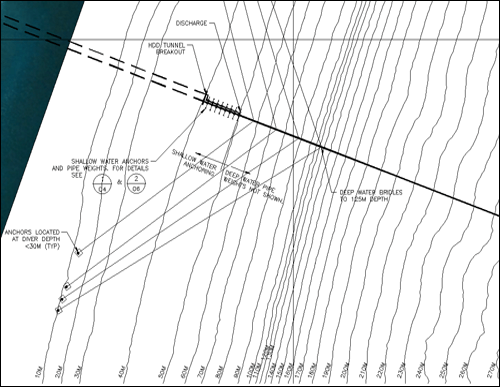 Important site characteristics include bathymetry, bottom roughness, soil conditions, slope, current profiles, obstacle location, wave conditions, environmental restrictions and shoreline geometry; these and other site conditions greatly influence the pipeline design and cost. A review of all existing offshore data (including data from adjacent or related areas) plus a site visit and dive in the shallow water will frequently suffice for an initial survey. 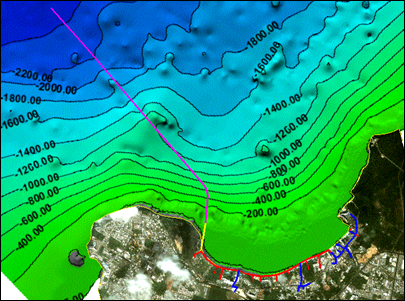 If bathymetry and bottom data are not available, it may be necessary to conduct a survey for this information. 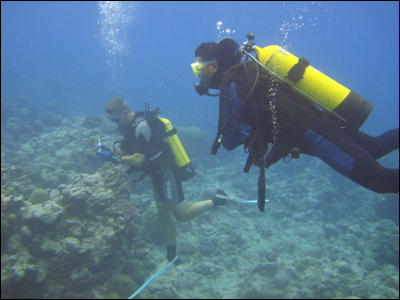 In addition, depending upon how much is known of the oceanographic characteristics in the area, it may be necessary to commence current measurements at a few key locations. Makai performs construction management, oversight, and quality control for marine-related construction projects. Typically, Makai provides these services as part of the construction and installation one of our pipeline designs, but we have also performed general marine engineering and construction management for ocean construction projects as well. A preliminary design is performed that concentrates on the critical aspects of the project that most directly affect the pipeline’s performance and costs. The final output of the design includes preliminary drawings, pipeline routing, an initial opinion of probable construction cost and a conceptual method for the deployment. A quickly and easily deployed pipe is the key to an economically viable pipeline. The importance of the deployment on the offshore pipeline cost and design cannot be overemphasized. The major pipeline costs occur during deployment, and there is an accompanying high concentration of activity and risk. This concentration of cost, structural loading of the pipeline and risk all occur in a relatively few days at sea. As a result, the deployment of the pipeline is often the major cost and design factor. Weights, loads, buoyancies and material strains are carefully balanced during the deployment such that the pipeline can both survive the deployment and serve properly once in place. Pipe joints are placed at critical points that ease pipeline handling and are avoided at points exposed to high loading. An important aspect of the preliminary design is to evaluate whether the pipeline is feasible and whether it will meet the requirements of the client by delivering water within his performance and budget restrictions. In order to complete this determination, a variety of pipeline configurations may be studied. Makai often provides innovative but practical solutions to difficult technical and budgetary problems. The preliminary design gives the client a first cut at the overall performance and costs such that this information can be integrated with his overall project. The preliminary design identifies critical oceanographic and site information that is needed for the final design and installation. 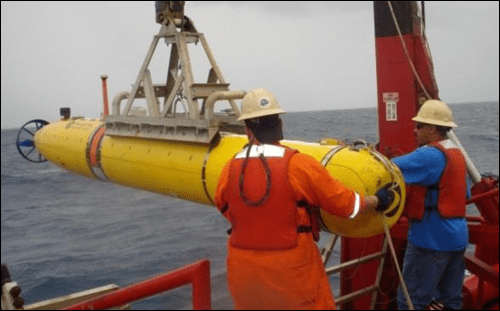 These needs may include the precise location of key obstacles on the ocean floor, measurement of shoreline geometry, collection of ocean current data, and verification of bottom slopes, soil conditions or roughness. 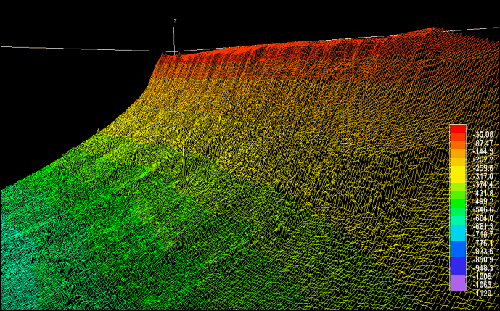 Surveying equipment may include SCUBA, manned submersibles or remote operated vehicles, ship deployed bottom samplers, acoustic bathymetry, sub-bottom profilers, side scan systems, and precision bottom roughness samplers. Makai has used all these methods in the past to determine route information. Not all these methods are required, nor desirable. Makai selects a combination that best fits the information needed, survey equipment available and project costs. Makai directs the survey to be sure that the quality is adequate for the design; whether Makai performs the survey directly or through a marine survey company depends upon whether the service is available and at what cost. Surveys are not inexpensive, and they can be a key factor in the overall budget. For this reason, the need for bottom information plays an important part in the design of a economical pipeline. 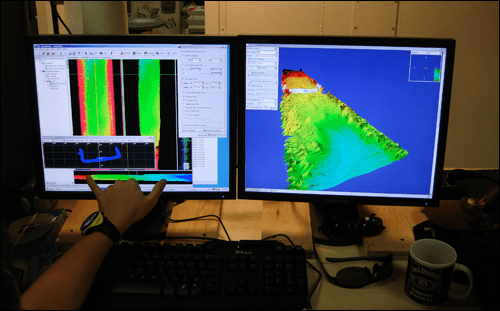 Makai has designed pipelines for steep and rough bathymetry that are independent of the bottom – thus minimizing surveying needs and lowering the overall project costs. Such decisions are made on a case-by-case basis. In the final design phase the design plans (drawings), specifications, and an opinion of probable construction cost are prepared. Careful attention is paid to every detail such that the hardware designed can be successfully deployed and operated over the desired lifetime. Details include wave loading, corrosion, pipeline fatigue, water flow dynamics on pump start-up and shutdown, maintenance, electrical routing, and deployment loads. If the client wishes a formal contractor bidding process, the design plans, specifications, and deployment guidelines are suitable. Makai has also worked for clients who have selected the contractor prior to or during the design process. Either process has its advantages and disadvantages depending upon the size of the overall project, the client’s relationship with the contractor, and whether it is a public or private sector project. During the design phase, Makai utilizes a variety of computer programs developed for deep water pipeline analysis and deployment. The drawings are also prepared and plotted using computer aided drafting (Autocad). Most deep water pipeline designs use polyethylene as the pipe material. Its main advantages are its buoyancy in seawater, flexibility for installation, high strength, resilience to shock, corrosion resistance, high fatigue strength, and almost unlimited lifetime underwater. Polyethylene design, however, is quite different from design with other materials: polyethylene is a viscoelastic material with properties that are a strong function of both temperature and time. 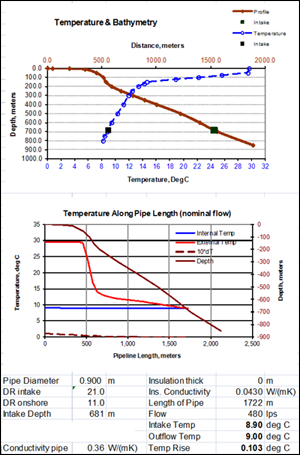 Acceptable design loads for a cool pipe for a short time are considerably different from design loads for a warm pipe over a long time. A design approach for a plastic pipeline that must reliably survive the deployment process must take into account these unique characteristics; this is a design strength of Makai Ocean Engineering. 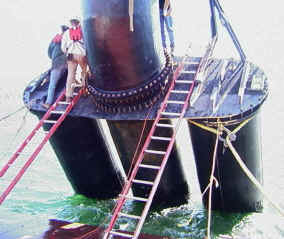 The risks and costs of the at-sea portion of the installation can be quite high because of the concentration of critical tasks, the quantity and variety of equipment involved, and the number of personnel working. An unplanned delay results in significant additional costs and some mistakes could end up causing the loss of the pipeline. These problems are inherent with all marine construction; proper planning of the deployment is a critical step resulting in lower risks and cost savings. A detailed deployment plan, written by the contractor, is necessary. The guidelines prepared by Makai form a basis for this plan, but the exact personnel, equipment, and scheduling of the contractor need to be included. A step-by-step procedure is written detailing each individual’s responsibility, materials required, and the major equipment involvement. 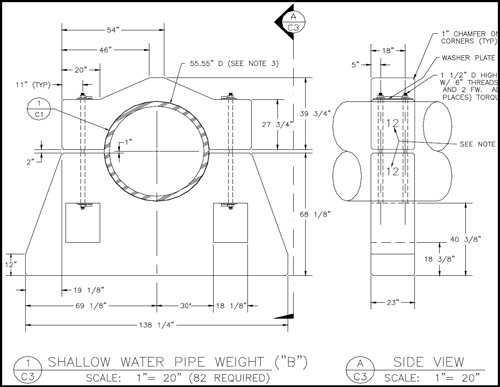 Makai reviews this deployment plan for the owner to assure that the pipe is properly handled and that it will be correctly placed on the bottom. Since the deployment process usually causes the highest stresses on the pipeline, Makai includes the deployment process as an integral part of the design, and is concerned that it be installed properly. Although relatively few contractors have installed pipelines using Makai’s methods, most properly equipped and conscientious contractors could do so. Using the considerable experience gained during our previous pipeline deployments, Makai can help guide the contractor to reduce the cost and equipment risk inherent during the installation process. The final role that Makai serves during the deployment is dependent upon the contractual relationship between the owner and the marine contractor, and the contractor’s confidence and experience. Makai typically serves as the owner’s representative, inspecting and observing the contractor’s work, and checking the adequacy of the contractor’s deployment planning. Other construction tasks are involved in addition to the deployment. Pump installation, shoreline installation, pipeline component fabrication, etc. are equally important but less critical relative to risks. Makai usually performs construction observation for these tasks. Pipeline inspection starts with the pipe fabrication by checking each component and ends with the overall performance check of the installed pipeline. As sections of the pipeline are completed, the pipe is checked relative to meeting the specifications and whether it will perform satisfactorily for the client. Onshore, shoreline, and nearshore portions of the pipeline are visually inspected as they are assembled and completed. 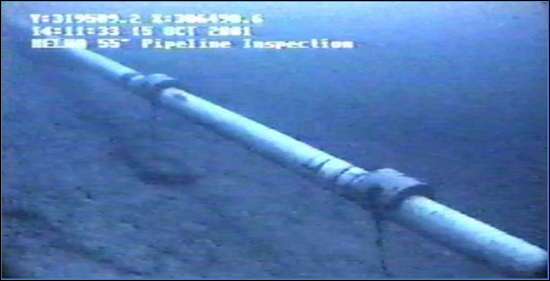 The deep portion of the pipeline can be inspected with an undersea submersible or ROV, although this may not be necessary for all pipeline designs. The final pipeline’s performance is checked in detail by pumping water and observing water flow rate, power consumption, water temperature, water quality, and pump start and stop dynamics. The demand for deep water marine intake pipelines is increasing as the cold water resources find greater uses in energy, aquaculture, and desalination. CWP technology has improved in the recent years to the point that there are numerous operating pipelines, and this technology is continuing to improve. The deep water polyethylene pipeline techniques that have been developed and demonstrated for OTEC and aquaculture intake pipelines are applicable to outfalls and transmission pipelines in both moderate and deep depths. Makai Ocean Engineering has been a key contributor to deep water pipeline technology development and demonstration, and Makai is continuing to work on larger and lower cost pipelines. No company has more deep water polyethylene pipe experience. Makai is eager to pursue any challenging pipeline project at any location.